Welcome to another look at the Outland, the world of Kid Largo. In January we’ve taken a break from updating the stories and instead are sharing details about the setting. I have pages and pages of scribbled notes, while a lot of it fleshes out the plot of Kid Largo stories there is also a sizable chunk of information about the world itself. Today we’re focusing on the mechanical denizens of the Outland. The first thing to understand is there are both robots and androids in the Outland and they are very different things. Robots don’t contain any real sentience or free will. They follow the commands or jobs they are given and will not deviate from the order. 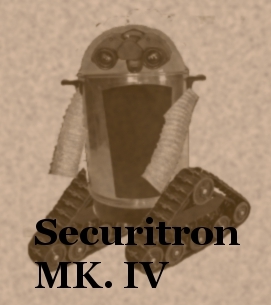 Robots can be unique one off builds or mass produced models like the Securitron MK. IV and Toast-T.
Androids can look identical to robots but are fully sentient. Not only can they think for themselves they also are capable of feeling an entire range of emotions. Androids have an innate since of what they call their Essence, this is what is believed to make androids different from robots. An android can be so damaged that their Essence fades away. Two androids can also merge their Essence if they have a mechanical vessel this combined Essence to move to. In this way two androids can actually create a family. Many scholars theorize that an android’s glow is an actual soul, although data like that is impossible to verify. It is unclear whether or not androids existed before the great disaster or not. Androids and robots face prejudices from a large number of the non-mechanical population of the Outland. The slang term “bot” is considered derogatory by androids, robots don’t have the ability to be offended by the tern. Those are some really interesting concepts and ideas; I'm digging it! Why bad Lincolns? Abe was the best president. Why not bad Roosevelts or Tafts or something? More Toast-T! I'm not actualy a huge Lincoln fan, but he has a very iconic look. If I named the gang the Tafts only like 3 people still alive would be able to recognize them. The beard, the mole, and the hat are instantly recognized.